When two inquisitive felines stared out the sliding doors of their home in Prior Lake, their view was a rather unusual one. 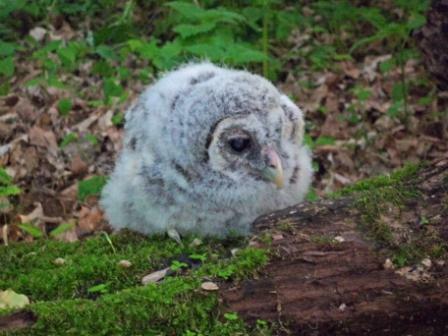 On the other side of the glass was a 3 week old downy barred owl chick. Apparently it had come out of its nesting cavity too soon, walked up a small hill, and took refuge against the wall of the house. The home owners, after attending TRC’s Spring Bird Release on May 5th, knew exactly what to do. They called TRC and the decision was made to drive it to TRC to make sure it was healthy. The owlet was given a clean bill of health (and a mouse breakfast) and returned home later that day. Finding its original cavity proved to be challenging, but once “mom” appeared, TRC volunteer and tree climber John Arent, found a safe spot to place the chick where its parents could resume its care. I love a happy ending to a good bird story - hope the parents have a good sense not to disregard the baby! What a very touching story. 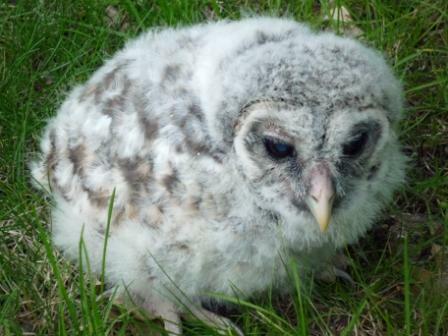 This is one very lucky downy barred owl chick. Many thanks to the tree climber who was able to place the little chick where the parents will be able to contine caring for it. All is well that ends well. Good Luck little owl.